One of circle track racing’s most popular carburetors, this unit has been one of the most difficult for engine builders to master. 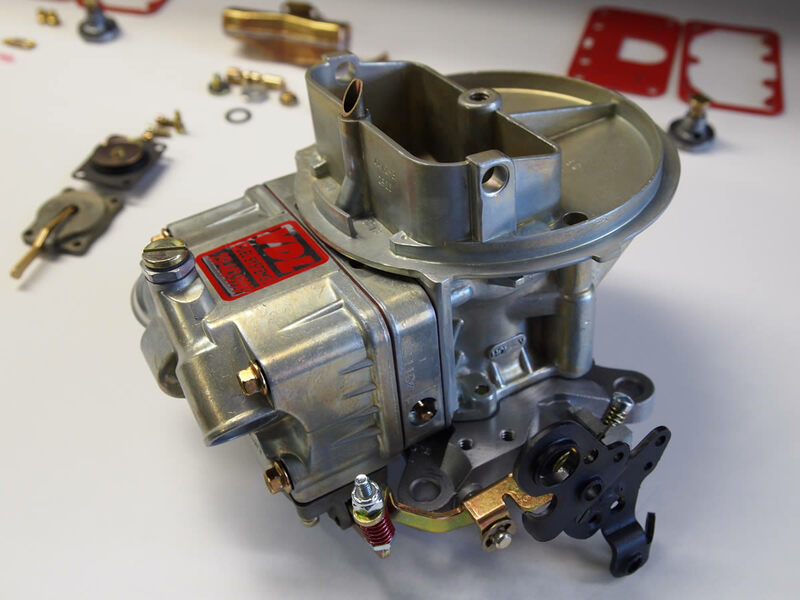 Typically, racers and engine builders have found this carburetor to be inconsistent which resulted in the fabled “dyno” carburetor that ran very well but was unavailable to the customer. Motivated by this problem, VDL Fuel Systems went to work on producing 4412 carburetors that were repeatable in their performance. In our search for this consistency, we discovered the weak links; which, when corrected, not only produced the consistent performance we were looking for but also produced superior power to anything previously available. The next step was to take our new product to the racetrack where racers have historically had drivability issues. The greatest performer on the dyno doesn’t mean a thing if it stumbles on the racetrack. What we found was the obvious: different applications require different set ups. This is just one more reason why racing carburetors will never be bought successfully “out of the box”! VDL Fuel Systems has done the job of producing the finest 4412 on the market. Now the challenge is up to you. Backed by our years of experience on the track and in the dyno room, we will provide you with the best carburetor you have ever purchased. Our repertoire includes the following 6 varieties of the 4412 carburetor. Each one will be built specific to your engine specs and track tech. Float Level – The fuel level in the bowl should be set at the bottom of the sight hole so that you have to jostle the car to get the fuel to come out the sight hole when running. We set the float in the shop to a particular setting; but fuel pressure dictates fuel level. Therefore you must set this when you first install the carburetor. Finally, after setting the float, always give the carburetor time to burn off enough fuel to reopen the needle/seat so that your new setting is really what you are seeing. Many times people lower the float too much because they haven’t waited a sufficient amount of time for the fuel to burn off and the new setting to take. Throttle Blade Adjustment – The throttle blade should be set at an rpm that is as low as possible to keep the transfer slots covered at closed throttle position. If you should lose your setting just back it completely off, put 1 round in, and start there. Idle Mixture Screws – Always adjust the 2 idle mixture screws evenly. The settings on both should be the same. If for some reason your engine absolutely needs a different setting on one side you can just about bet something is wrong with the engine causing it to have a different signal/vacuum on that side. Our original setting is 1 1/2 turns out. Fuel Pressure – 6 to 7 pounds, no more and no less. You should absolutely know what your fuel pressure is! Many racers have no clue what their fuel pressure is, and they chase engine problems for weeks when a simple fuel pressure gauge would have indicated the problem straight away. Vent Tube Clearance – You must have at least ¾” clearance above the vent tubes. It is ok to lower the vent tubes if absolutely necessary, but you will begin to run the risk of fuel spilling over in the turns if you are not careful. Pump Circuit Tuning – Because of the differences in track conditions and driving styles you may need to adjust the pump circuit, i.e. pump cam/pump arm, to correct “off corner” stumbling issues. If an engine stumbles two or three times after the driver steps into the throttle this usually indicates too much fuel and can be corrected by adjusting slack in the pump arm or installing a smaller pump cam. If an engine has a “dead hesitation” and then picks right up and goes, this usually indicates not enough fuel on the pump circuit. First check that the pump arm has no slack in the adjustment then proceed to increase pump shot with either a larger pump cam or a larger pump nozzle.